sundars Diary: Nokia 1209 - Is it good? Hi guys. I have decided to buy nokia 1209 as replacement to my Motorola w388. My Moto was not good in battery life. It last for only one day with heavy usage. 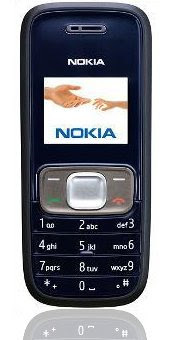 The Nokia 1209 is triband GSM phone with CSTN 65k color display and with long lasting battery. I head it has torch light also. It is available at retail price of about 1500 rupees in coimbatore, Tirupur, chennai. Anybody got it and want to sell? I am ready to buy it. Please contact me.